The second Belmont (AGTR-4) was laid down on 25 January 1944 at Portland, Oreg., by the Oregon Shipbuilding Co. under a Maritime Commission contract (MCV hull 94) as Iran Victory; launched on 25 March 1944; sponsored by Mrs. Peter Hegge; and delivered to the Maritime Commission on 23 April 1944. The Maritime Commission then turned her over to a civilian contractor, the Pacific-Atlantic Steamship Co., for operation. The cargo ship continued operations, manned by a civilian crew provided by a series of contractors until laid up at Astoria, Oreg., with the National Defense Reserve Fleet sometime between April of 1954 and April of 1955. In February 1963, Iran Victory was acquired by the Navy and entered the Willamette Iron and Steel Co. yard at Portland, Oreg., for conversion. On 8 June 1963, she was renamed Belmont and designated a miscellaneous auxiliary AG-167. She was redesignated a technical research ship AGTR-4 on 1 April 1964 and was commissioned at the Puget Sound Naval Shipyard on 2 November 1964, Comdr. Jerome E. Henderson in command. Belmont completed outfitting at Puget Sound during November and, on 2 December, departed Bremerton, Wash., bound for her permanent assignment with the Atlantic Fleet at her new homeport, Norfolk, Va. She arrived there on 21 December 1964 and, exactly one month later, got underway for a five-week cruise to the West Indies that included shakedown training and concluded with port visits to Kingston, Jamaica, and Key West, Fla. She returned to Hampton R oads on l March and entered the Norfolk Naval Shipyard for a month of post-shakedown availability. Final acceptance trials occupied 29 and 30 March and preparations for her first operational deployment followed. On 26 April, Belmont passed between the Virginia capes into the Atlantic Ocean and laid in a course for the West Indies. Two days at sea, the ship received orders to proceed to the vicinity of the Dominican Republic where, four days earlier, a revolt of left-wing factions had broken out. Belmont remained on station observing conditions until the middle of July. On the 13th, she headed back to Norfolk where she arrived four days later. After almost two months in port, the ship once more got underway on 14 September and spent about a month cruising in the West Indies before transiting the Panama Canal in mid-October. For the remainder of the year, she conducted operations along the western coast of South America, including visits to Valparaiso, Chile, and Callao, Peru. New Years Day 1966 found her at anchor in Callao. Two days later, she weighed anchor to return to the Canal Zone. Belmont retransited the canal on 21 January and moored in Norfolk on the 28th, where she remained for almost seven weeks for upkeep and shipyard availability. On 16 March, the ship embarked upon another deployment to the western coast of South America. She transited the Panama Canal on 28 and 29 March and, for the next eight weeks, cruised along the coasts of Peru and Chile. Belmont returned to the Canal Zone for a five-day visit between 23 and 28 May. On the latter day, she departed Panama and embarked upon five weeks of unspecified operations in the South Pacific. The ship arrived back in the Canal Zone on 13 July, transited the canal on the 14th, and reentered Norfolk on the 20th. After seven weeks of upkeep in her homeport, Belmont stood out to sea on 7 September, bound for her third assignment in the Pacific coastal waters of South America. She transited the Panama Canal again on 19 September and, two days later, shaped a course for her zone of operations. At the conclusion of that assignment, the ship returned to the Canal Zone on 4 November. She proceeded through the canal on 8 November and then set course for Norfolk. Belmont reentered her homeport on 14 November and spent the remainder of the year in the Norfolk Naval Shipyard installing communication gear. The ship spent the first month of 1967 completing the installation of her new communications equipment and testing it. On 1 February, Belmont loosed her mooring lines to begin an extended cruise to the southern hemisphere--one that included a circumnavigation of the South American continent. Hydrographic and communications research highlighted the five-month voyage as did visits to sundry South American ports. Belmont completed her circuit of the South American continent on 3 June when she transited the Panama Canal and laid in a course for Norfolk. The technical research ship pulled into her homeport on 9 June and commenced a repair period. Her hull and various items of equipment received repairs over the next two months. On 14 August, she stood out of the Chesapeake Bay bound for the Indian Ocean. The ship rounded the Cape of Good Hope on 5 October and spent the following six weeks engaged in special operations along the eastern coast of Africa. On 22 November, she redoubled the cape and, after an overnight stop at Monrovia, Liberia, on 2 and 3 December, pointed her bow west for the homeward voyage. Belmont arrived back at Norfolk on 12 December and spent the remainder of the year engaged in holiday leave and upkeep. January 1968 found Belmont still at Norfolk. On the 26th, she began regular overhaul at the Norfolk Naval Shipyard. She emerged revitalized on 14 May and put to sea to conduct refresher training in the Guantanamo Bay, Cuba, operating area. The ship completed post-overhaul training on 14 June and, after a visit to San Juan, Puerto Rico, embarked upon her second deployment to the coasts of Africa. On 2 July, she arrived off Cape Palmas and commenced operations along Africa's western coast. That phase of the assignment lasted until 25 September at which time she passed the Cape of Good Hope and entered the Indian Ocean. That portion of her mission proved relatively brief, occupying her time during the last week in September and the month of October. On 1 November, Belmont retraced her course around the Cape of Good Hope and steamed back into the Atlantic. The ship stopped over at Recife, Brazil, from 13 to 16 November and then headed for the northeastern coast of South America and a series of operations in that vicinity. Belmont completed the last mission of the cruise on 24 November and headed home. She moored at Norfolk on 28 November and remained there for the rest of 1968. During the first half of 1969, Belmont stayed in or, infrequently, operated near Norfolk. A restricted availability followed by sea trials occupied the first three months of the year. Early in April, she began installation of additional equipment. May brought tests and type training in the Virginia capes operating area. In June, she began preparations for overseas movement. On 17 June, Belmont left her berth at the Norfolk Naval Station bound for her first and only tour of duty with the 6th Fleet in the Mediterranean Sea. She passed through the Strait of Gibraltar on the 28th and joined the 6th Fleet. Over the next four months, the technical research ship ranged the length and breadth of the MED conducting a series of special operations and making stops at ports all along the Mediterranean littoral. However, she spent the majority of her time in the eastern portion of the sea near Kithera, Greece, and the island of Crete. 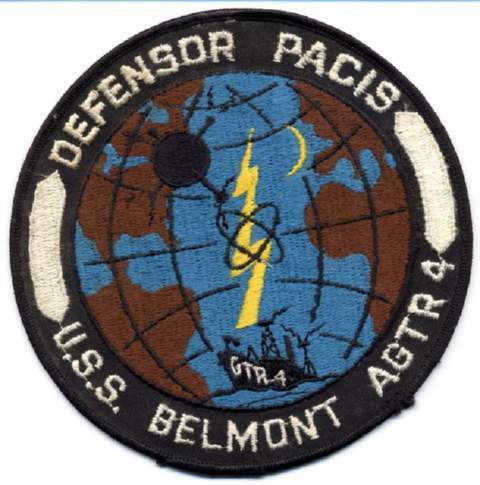 Belmont concluded the last deployment of her career at Rota, Spain, on 21 October and shaped a course back to the United States that same day. She arrived back in Norfolk on 3 November. Three weeks later, the ship received the close scrutiny of a board of inspection and survey. As a result, she was found to be of limited naval value. Accordingly, Belmont was decommissioned at Norfolk on 16 January 1970, and her name was struck from the Naval Vessel Register that same day. On 24 June 1970, she was sold to the Boston Metals Co., Baltimore, Md., for scrapping.